For those of you who are creating dynamic website, of course you create also admin panel system. In this tutorial, we create Dashboard Admin Panel using PHP and MySQL to input and delete news as well as the feature to view all list news published. The theme of dashboard that we use is Bootstrap Admin LTE. Here, we add scipt php, so that it becomes more useful in the management of news. 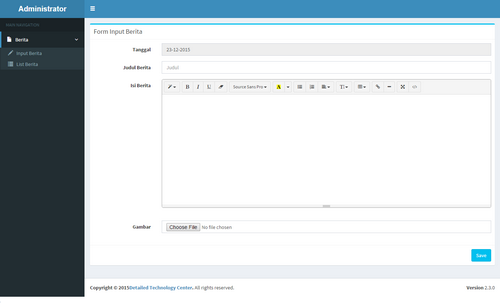 For news input process we use Summernote as WYSIWYG Web Editor. By using this editor, we make administration as easy as possible for the input of a news. In the process of inputting news, there are feature that automatically detects date local time, to input the title of news and upload dan display image. As seen in the Fig.1, an administrator can input the date, title, and content of a news by using sommernote editor. Especially for date, we can't change it (disabled) because it will be detected automatically current date from your time and date zone in your local system. An administrator can also upload image, so that it can be placed above or beside the content of news if you make interface in the front-end. At the list of news as shown in Fig.2, an administrator can see a collection of the news that has been published. We can choose how many news displayed. For that we use the pagination. At the news list there are also features to edit and delete the news.